Background: As part of the International Higher Education Interfaith Leadership Forum, in September 2016 Sara Singha conducted an interview with Radia Bakkouch, who is president of Coexister. 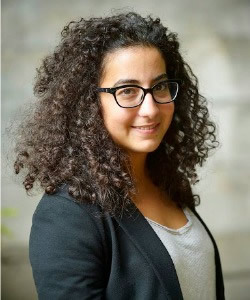 Bakkouch reflects on the challenges of doing interfaith work in France, the role of universities in bringing together people with diverse backgrounds, and the importance of reaching across divides to build relationships. Please tell us about your current work/role, and in what capacity it influences/incorporates interfaith efforts? I am currently the president of Coexister, the interfaith youth movement that gathers young people between the ages of 15 and 35—Jewish, Muslim, Christian, atheist, Buddhist, etc.—really all the diverse people we can find in France. What we’re trying to do is accept everyone’s identities and use them as a positive way to act together in society. Our main work is to act together in terms of solidarity. We learn about each other with a dialogue and solidarity program, and then we do some advocacy work. The final goal of all our actions is to create a bond between young people of different faiths. How do you define interfaith service, and what are the essential components of interfaith service work? For us, interfaith service is very powerful because we use all the resources of different religious and philosophical convictions. We use everything that individuals can bring to the organization, and put it together so our actions are more deep, thoughtful, and positive. That’s how we can define interfaith service work. We say it’s more positive to act as a diverse body, rather than just being involved in one faith community, because we can create a real diverse society and accept the faith of others and still find common things to do together. Can you share a story about your personal background to illustrate how it inspired you to engage in interfaith service efforts? I’m Muslim and French, but I also have Moroccan, Lebanese, and Palestinian origins. The question of the Israeli-Palestinian conflict was very present in my family history. What I’ve always wanted to do is understand what it’s about, and focus on the people involved, so I went and studied on exchange in Tel Aviv for a year. I didn’t want to get involved in the political side of the conflict; I wanted to understand the people, and I understood that the situation is more complicated than how it’s shown on the media. That’s when I understood that a solution to such a conflict has to come from the people, if they are less afraid and more motivated to go engage with the other. That’s what motivated me to do interfaith work when I returned to France. In France, even if we have a big diversity, we leave our faith at home, because it’s a little taboo, and we don’t want to talk a lot about religion. So I wanted to get involved in France after my year in Tel Aviv. Can you share some highlights from your academic and professional background? In your opinion, what is some of the most important work you have done in terms of interreligious studies or efforts? I just graduated, so I have a master’s degree in international relations from Sciences Po in Paris, focusing on the Middle East. I did most of my interfaith work in Tel Aviv, where I studied Judaism and Islam in the context of the Middle East, and the history of the conflict. So that’s really where I worked on those things. To what extent should higher education institutions play an active role in interfaith service work and projects? In France, the university is really the place where you can see religion and you can more openly have your faith. You can come to the university as a Muslim, Jew, Christian, atheist, etc., where everyone is mixed. We have a very good public university system. So everyone comes to university—whereas in high school, a lot of the Jewish community goes to yeshivas or private schools, as does a lot of the Catholic community, and a lot of the Muslim community lives in certain concentrated areas and is not as mixed with the rest of society. But in university, everyone comes together to the cities, such as Paris. The first role university should play is to acknowledge the fact that they gather people from different and diverse faith backgrounds. The second is that the question of interfaith can be a really important topic in terms of conferences, seminars, etc., because we are very free in our discussions in the universities and can discuss any topics. The third is a more contextual answer; we need to work on how Islam is going to be more at ease in France. It’s really a current topic that everyone talks about. Universities can talk about the subject more calmly, without all the hysteria surrounding the issue. What kinds of support have you received—from your government, friends and family, institutions, organizations—in pursuing interfaith service related work? We have had the chance to have many partnerships. We received great support from the government because we won a presidential prize, “France Get Involved,” and receive financial and promotional support. One problem today, though, is that the government is really divided. So we have the support of the presidential cabinet and the educational cabinet, but we don’t have the support of the prime minister’s cabinet. Then, from friends and family, it depends on the people involved in the organization. My family will help, but we have some members whose families are really not supportive of their involvement with Coexister. Then it is important for people to to talk about our work, and talk about it in the context of their own family and environment. We are trying to be in good contact and have good relationships with all of the religious communities. So we know the Muslim, Jewish, and Catholic organizations, as well as other local contacts. Each group of Coexister tries to have good relationships with their local religious branches—temples, mosques, etc. We have a good relationship with youth movements and informal education movements working in the rural and more difficult parts of France. What have been your greatest challenges regarding peacebuilding and interfaith/intercultural dialogue and cooperation? I think one of the biggest challenges I’ve faced is that since I’m president of organization, I’m the face of the organization and am not protected by other members or working behind the scenes. After the terrorist attack in November in Paris, we tried to put everyone who doesn’t like each other at one table, and say that we have to be united against terrorism, even with all of our differences. We managed to gather everyone around the table, but then a lot of people tried to destroy our work, saying we are closed off to extreme parties. Because we were in a situation with a lot of tension and fear, we had to help people understand why we were doing that. When I was in university, I had the chance to be at a very progressive and open-minded school, so I found some of my best friends from different faiths. When I was in Tel Aviv, there were eight of us from my school. We were a very interfaith group. We were only 45 minutes from Jerusalem, living in this amazing place, and doing interfaith work. We created a very great bond with each other. At my university, we also had the chance to have the Muslim, Jewish, and Christian organizations working together. That’s really something interesting, and they’ve been working together for three years now. I love when we do national events with all of the members of Coexister. I see people are a little afraid and unsure at first of what they will find, or what they want to learn more about. They usually find something greater than what they expected, and find that they can be the person they are and believe what they believe and also be part of something greater. It happens about three or four times a year, and people really change from the beginning to the end of the weekend. What is one thing you would like to see change in your community in terms of interreligious relations, cooperation, and understanding? I used to live in Morocco before, for 14 years, before I came to France. And Morocco is a really good example of how relations between religion and faith can be at peace, but my friends in Morocco don’t really get involved in it. They don’t use this treasure of the existing peaceable relations to build something great. Meanwhile, I think something you can find in the Parisian environment is that Parisians don’t see the great wealth of diversity there is in Paris as a treasure, or think about how we can use that. I hope people can open their eyes and learn that they can take responsibility and do great things and be a part of great changes. Are there any other final thoughts you would like to share? Our motto is “diversity in faith and unity in action.” We keep this in mind at all times, and I think it’s important, because we really have to wake up everyday and remember that diversity and working with interfaith groups is something positive, and that we can all be a part of that. That’s what we’re trying to convey to all our members.